China Sinopec's new Tianjin terminal receives liquefied natural gas cargo in Tianjin, China, on February 6, 2018. The Trump administration frequently pushes natural gas exports in high-level talks with Beijing. Most recently, after threatening to impose tariffs on Chinese technology imports, some administration officials are stating that the tariffs can be reduced if China buys more U.S. natural gas.1 The Trump administration is pitching a very simple argument: If China imports more natural gas from the United States, that will help rebalance the U.S.-China trade deficit—which rose to a record $375.2 billion during President Donald Trump’s first year in office—and generate American jobs.2 In reality, that argument reflects a deep misunderstanding about how today’s global energy markets actually work. At first glance, the United States and China do have good synergies in this sector. 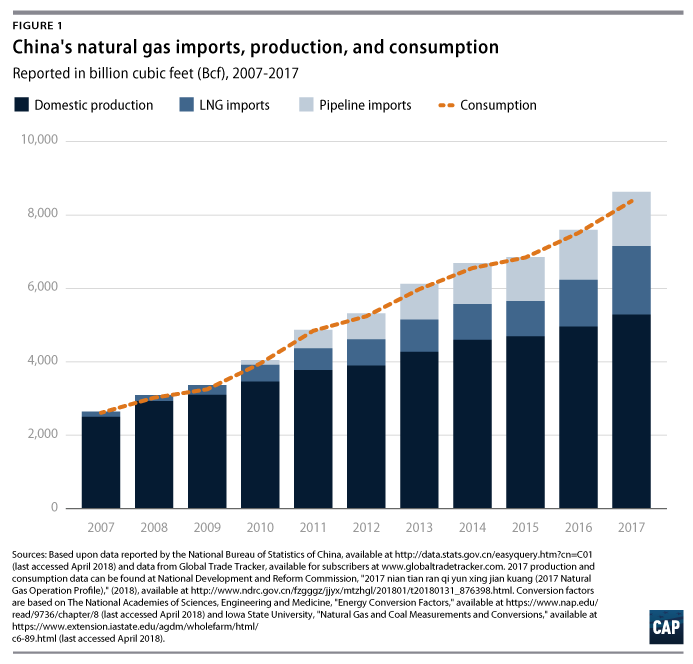 China is consuming more natural gas than it can produce and seeking new imports; the United States is the world’s largest producer, and the Trump administration wants to send more of that production overseas. Trump routinely uses his meetings with President Xi Jinping and other Asian leaders to push natural gas export deals. That push played a role in preliminary U.S.-China deals inked last November and is generating excitement on both sides of the Pacific about a potential U.S.-China natural gas trade boom. Beijing is currently leveraging natural gas imports to fill a reform gap: Demand-side reforms have thus far been more successful than the supply-side. If Chinese leaders can push forward needed reforms on the supply side, the nation’s import dependence may decrease. The United States has a geographical disadvantage exporting to China and is better placed to serve other growing markets. The Trump administration is pushing U.S.-China natural gas investment deals that ignore current market trends. The Trump administration’s fossil fuel obsession risks forfeiting a much bigger strategic game in clean energy technology. Chinese President Xi has big ambitions. His vision for an ideal future U.S.-China economic relationship is one in which the United States exports commodities to China while China steadily edges the United States out as the dominant player in global high-tech markets, including clean energy markets. In that scenario, the United States gets the lower end of the value chain and China dominates the higher end, thus winning the best jobs. Chinese leaders know that, globally, the world is already installing more new renewable energy generation capacity than new fossil fuel-based capacity.4 Even major oil and gas exporters such as Saudi Arabia and the United Arab Emirates are investing billions in renewables—they see where the market is headed and do not want to be left behind. Chinese leaders view clean energy as a major battlefield in their nation’s quest to surpass the United States as the new high-tech superpower, and entertaining the Trump administration’s fossil fuel export initiatives is a useful tactic for keeping the United States occupied on the sidelines while China runs the field. There is little question that China’s rising natural gas consumption is an exciting trend. If Beijing leverages natural gas to replace coal and reduce the nation’s overall fossil fuel emissions—neither of which is guaranteed—that could be good for the planet. However, this trend is unlikely to generate game-changing jobs for the United States, and the Trump administration’s determination to promote fossil fuel exports at any cost undermines broader U.S. economic interests. If the administration accepts natural gas export promises from China in exchange for backing off from much broader U.S. trade complaints—as U.S. Secretary of Commerce Wilbur Ross is suggesting—that will undercut the U.S. economy even further. Understanding these dynamics is critical for assessing what the current administration’s U.S.-China natural gas initiatives are likely to produce over the longer term. China is a major natural gas producer and consumer. For decades, Beijing controlled pricing and activity on both sides of the market—production and consumption—and those controls hindered natural gas development in China. Natural gas currently accounts for just 7 percent of China’s total energy consumption compared with 29.2 percent in the United States, 23.7 percent in Germany, and 22.5 percent in Japan.5 Over the past five years, Chinese leaders have rolled out a series of policy reforms designed to relax the old controls, create more room for market competition, and encourage more production and consumption. These demand-side policies are having an impact. Between 2013—when Beijing first launched the Clean Air Action Plan—and 2017, China’s total natural gas consumption grew 41 percent, averaging roughly 9 percent growth per year.12 As consumption rises, Beijing is also rolling out three major supply-side reforms to drive domestic production—China has both onshore and offshore reserves—and imports. Third, Beijing is taking steps to gradually relax state-owned enterprise control over domestic production. If Chinese leaders can break open their nation’s upstream sectors, that will be the real game-changer. The U.S. Energy Information Administration estimates that China may have as much or more shale gas than the United States, but development has been sluggish.28 Overall, China’s annual domestic production growth has decelerated from more than 19 percent in 2005 to less than 12 percent in 2010 and just over 2 percent in 2015.29 Chinese leaders are hoping to turn that trend around. Beijing’s 13th Five-Year Plan for Natural Gas Development targets 7.3 trillion cubic feet of production by 2020, up from 4.8 trillion in 2015.30 In 2016, year-on-year growth in China’s reported domestic production bounced back to just more than 5 percent.31 In the United States, private sector competition played a key role in driving some of the technology and process innovations that unlocked shale gas development.32 For that to happen in China, Beijing will have to break down an array of market barriers that currently stifle competition in the nation’s upstream sectors. For example, state-owned companies control the best oil and gas plays and, in some cases, sit on them without either developing them or allowing other companies to do so. China’s geological data is classified, so private companies and investors have no idea how much natural gas the country has or where it is located. Plus, state-owned companies control the pipelines and often either deny pipeline access to private companies or charge exorbitant rates, thus making it hard to bring those extra supplies to market. Beijing is taking steps to address these problems, but progress has been slow, so they are currently relying on imports to meet the nation’s rising demand.33 Going forward, however, if Chinese leaders get serious about supply-side reform, the next unconventional gas revolution could occur in China. As of 2017, China is already the third-largest global shale gas producer behind the United States and Canada.34 Natural gas exporters should take China’s production potential into account—and Beijing’s growing determination to unlock that potential—when making investments that hinge on a continued rise in Chinese import demand. U.S. natural gas exports to China did not begin in earnest until August 2016, when Houston-based Cheniere Energy began shipping LNG to Chinese buyers from its Sabine Pass liquefaction facility.48 In 2016, China imported 17.2 billion cubic feet of LNG from the United States.49 In 2017, that increased to 100 billion cubic feet,50 making the United States China’s ninth-largest natural gas supplier behind Papua New Guinea. All of the U.S.-to-China shipments departing in 2017—29 total cargoes totaling 100.01 billion cubic feet51—came from Cheniere’s Sabine Pass facility.52 Cheniere has a unique toll gate business model: The company is not directly involved in production. Instead, it purchases gas from U.S. producers, liquefies it at Sabine Pass, and sends it overseas. When Cheniere signs long-term contracts, it is not agreeing to produce a set amount of gas but rather to procure and liquefy it on the buyer’s behalf. In February, Cheniere Energy inked a long-term deal with China National Petroleum Corporation to supply up to 1.2 million tons—58.4 billion cubic feet—of LNG per year until 2043.53 Cheniere can fill those shipments with a combination of spot market purchases—taking advantage of price dips wherever possible—and longer-term supply contracts with producers willing to supply larger shipments to Cheniere at wholesale rates. Overall, exporting LNG from the United States to Asia is an expensive proposition. That can make sense for import markets such as Japan that can pay high prices. Japan, for example, paid an average of $6.13 per thousand cubic feet for the LNG shipments it received from the United States in 2017. In comparison, China paid an average $4.32 per thousand cubic feet,71 and even at that rate, the shipments it received from the United States were among its most expensive, as mentioned above. If the United States has better export alternatives, why would the White House put so much political capital into pushing for deals with Beijing? These trends raise an important question about the Trump administration’s China strategy: If the United States has better export alternatives, why would the White House put so much political capital into pushing for deals with Beijing? Furthermore, why would administration officials even consider accepting those deals as a major Chinese trade concession—as Secretary Ross is suggesting—instead of holding the line to demand Chinese action on much bigger trade policy issues? Many of the voices that are bullish on U.S. LNG exports to China are hoping for long-term infrastructure investment deals. With this business model, the buyer agrees to invest in production infrastructure and, in return, gains access to the natural gas the project produces at a set price over 10- to 20-year time horizons. Since prices can shift substantially over a decade and the upfront capital costs are spread out over a long time frame, this approach can make sense even when current price alignments are less than favorable. In Australia, for example, Chinese investment has been key for developing some of that nation’s recent natural gas infrastructure.74 Australia’s natural gas resources are generally located in sparsely populated regions of the country or offshore, and the pipeline and processing infrastructure needed to link supply and demand would be costly relative to the country’s small population. To address that challenge, Australia actively courted overseas investors—including Chinese corporations—willing to bankroll development projects in exchange for long-term access to the gas those projects produce. Chinese investors are also active in the United States. Since 2010, Chinese companies have invested $12.34 billion in American oil and natural gas companies, approximately $6.3 billion of which is invested in American companies solely working in natural gas.80 Both the United States and Australia have prevented China’s state-owned enterprises from controlling their domestic oil and gas resources: Those firms could make minority-share investments, but they could not control how much gas is pulled out of the ground or where it is sent. In the United States, however, President Donald Trump is aiming to change that arrangement. In reality, these deals should be viewed with a healthy dose of skepticism, because global markets are shifting in ways that make fixed infrastructure investments of this nature increasingly unattractive. Two big trends are having a particularly important impact: shifts in market pricing and technical innovations in natural gas import and export infrastructure. On the pricing front, LNG markets are shifting from oil-linked to hub-based pricing, and that is making long-term infrastructure investment contracts less attractive. When trade first began in 1964, there was no standard pricing model for natural gas, so buyers and sellers generally used crude oil prices as a commonly accepted benchmark.85 At that time, long-term contracts were a useful strategy for locking in price security against the volatile price of crude oil. If private companies are walking away from these infrastructure projects, that raises potential red flags about China’s intentions. One senior Chinese government official interviewed by the authors of this report stated that China’s only reason to sign LNG contracts of this nature with the United States is to win political concessions from President Trump. If Beijing is willing to pay more than $100 billion—the combined costs of the Alaska and West Virginia projects—to get those concessions, the American public will need to know exactly what we are giving China in return. Even if Beijing’s only intention in potentially bankrolling U.S. infrastructure is to add to their nation’s supply diversification—unlikely, given that China already has 26 suppliers—there are still valid concerns about giving China a controlling stake in U.S. production. Chinese state-owned enterprises, including oil majors, answer to the Chinese Communist Party. Those firms are tools of the state and behave accordingly.99 If those firms obtain massive shares in U.S. natural resources—large enough to potentially control how those resources are used and effectively bankroll the state and local economies in which they operate—that raises important questions about how that might affect U.S. national security. The first U.S. LNG exports departed from Kenai, Alaska, in 1969.100 The Kenai terminal exported LNG primarily to Japan. During its heyday from 2000 to 2006, Alaska exported more than 60 billion cubic feet on average per year.101 Starting in the mid-2000s, however, Kenai encountered commercial headwinds. The state has a natural advantage in proximity to Japan and other Asian markets—including open ocean access rather than the necessity of transit through congestion points—but that does not overcome other market disadvantages it faces. If individual American companies find good commercial opportunities to export natural gas to China or other buyers, they should go forth—provided, of course, the United States has the regulatory structure in place to make sure those resources are extracted, processed and transported without damaging American health and property. Problems arise, however, when the White House throws massive political capital into pushing deals that do not make good commercial sense. Those problems are magnified when the federal government does so at the expense of American companies and technologies that do have great commercial potential. Unfortunately, that is exactly what is currently happening on the clean energy front, and the ramifications could significantly undercut U.S. competitiveness over the longer term. When Trump administration officials frame natural gas exports as a major demand in U.S.-China trade talks that risks undercutting the U.S. economy even further. Beijing is deploying an array of nationalist economic policies—including the Made in China 2025 initiative—that leverage state resources to help Chinese companies push American competitors out of global high-tech markets. The Trump administration recently threatened to retaliate by levying tariffs against $50 billion in Chinese imports. The tariff approach is problematic on multiple fronts—it will likely hit U.S. consumers as hard if not harder than China—but the Trump administration will wade into truly dangerous waters if it first threatens China with tariffs and then offers to reduce them if China buys more LNG from the United States. When the administration announced the new tariffs, U.S. Commerce Secretary Wilbur Ross stated that “we will end up negotiating these things rather than fighting over them.”124 According to Secretary Ross, President Trump has asked President Xi for a $100 billion reduction in the U.S. trade deficit, which, according to Secretary Ross, China can partially fulfill by shifting its natural gas supply chain from other nations to the United States. In addition to the fact that—as outlined above—that does not make good commercial sense for either nation, if the administration accepts LNG deals as a major trade concession that will give Beijing a pass on much bigger trade issues that, if not adequately addressed, will undermine U.S. competitiveness for decades to come. Natural gas consumption is rising in China. That is a good thing for China’s energy transition and emission-reduction efforts. If individual American firms find commercial opportunities to provide some of that natural gas, they should go forth. At a national level, however, the U.S. federal government should not push export deals that do not make good commercial sense and risk undermining broader U.S. competitiveness vis-a-vis China. Unfortunately, that is exactly what the Trump administration is currently doing. As Beijing is well aware, clean energy is the real battleground, and while China is doing everything it can to help its own companies dominate that rapidly growing global market, the Trump administration is undercutting U.S. clean-tech innovation and wasting federal government political capital pushing for natural gas deals that the United States does not actually need. If the administration takes this a step further—as Secretary Ross is recommending—by accepting U.S.-China natural gas deals in exchange for backing off on much broader U.S. trade concerns with China, that will further undercut the U.S. economy and play right into Beijing’s hands. Melanie Hart is a senior fellow and the director for China Policy at the Center for American Progress. Luke H. Bassett is the associate director for Domestic Energy Policy at the Center. Blaine Johnson is the policy analyst for China and Asia Policy at the Center. For a table of U.S. LNG shipments to China as of year-end 2017, see the PDF. January 2013—12th Five-Year Plan for Energy Development (2010-2015), State Council:125 Sets new natural gas production and consumption targets for 2015, including: increasing the share of natural gas in the nation’s energy mix from 5.3 percent at year-end 2010 to 7.5 percent by 2015; increasing natural gas production capacity 10.5 percent annually through 2015; increasing natural gas-fired electricity generation capacity 16.2 percent annually through 2015; and increasing the number of residential natural gas users by 6.8 percent annually to reach 250 million total users by 2015. June 2013—Notice Adjusting Natural Gas Prices, National Development and Reform Commission:126 Implements a net-back pricing model that pegs domestic city-gate rates to the market rates for fuel oil and liquid petroleum gas. Fuel oil accounts for 60 percent of the new price-guiding basket and liquid petroleum gas for 40 percent. Divides natural gas consumption into two buckets defined by volume: base and incremental. Rate increases for base gas—volumes equal to or less than 2012 consumption—are capped at 400 Chinese yuan per thousand cubic meters. Rates for incremental gas—for volumes exceeding 2012 consumption levels—follow the new pricing scheme. Grants special rate exemptions to the chemical fertilizer industry and residential users. The price increase for fertilizer industry purchases is capped at 250 Chinese yuan per thousand cubic meters, and local governments can provide additional financial relief if needed. Prices remain unchanged for all existing residential natural gas consumers; new users will pay the new city-gate rate for base gas. Liberalizes ex-factory prices for imported liquefied natural gas (LNG) and unconventional gas—including shale gas, coal-bed methane, and coal-based liquefied gas—except in cases where such gas is mixed with other sources in long-distance transmission pipelines, in which case city-gate rates apply to the mix. September 2013—Air Pollution Prevention Action Plan, State Council:127 Orders major urban areas along China’s eastern seaboard to reduce coal consumption; close down coal-fired industrial boilers and power plants; and bring in natural gas and renewables as substitutes to meet new 2017 air pollution reduction and control targets. Calls for expanded natural gas pipeline capacity. Directs relevant ministries, agencies, and subnational governments to give residential users and coal-replacement projects priority access to new natural gas infrastructure and supplies. February 2014—Trial Supervision Measures for the Fair and Open Access to Oil and Gas Pipeline Networks, National Energy Administration:128 Orders state-owned oil and gas pipeline operators with surplus capacity to provide pipeline access and services—including transport, storage, gasification, liquefaction, and compression—to third-party entities in a fair and nondiscriminatory manner according to the order in which contracts are signed. The National Energy Administration will supervise the opening of oil and gas pipeline network facilities and will establish regulations on information disclosure and other issues relating to fair access. February 2014—Natural Gas Infrastructure Construction and Operation Management Measures, National Development and Reform Commission:129 Encourages both state-owned and private companies to invest in, construct, and integrate national gas infrastructure. Orders those activities to comply with relevant development plans—such as the national natural gas infrastructure development plan and the national main functional area plan—and to fit market supply and demand conditions. Imposes new information transparency requirements: Companies that own and operate natural gas infrastructure must publish their capacity and services available to third-party users as well as the conditions and procedures for third-party access. Orders infrastructure operators to provide third-party access in a fair and equitable manner. March 2014—Guiding Opinion on Establishing and Improving the Progressive Pricing Mechanism of Natural Gas for Residential Consumption, National Development and Reform Commission:130 Launches a new three-tier pricing mechanism for residential natural gas that bases residential rates on household consumption levels. Gives local governments the flexibility to determine whether to assess household consumption on a monthly, seasonal, or annual basis. Based on that assessment, high-volume users will be placed in a high-rate bucket, mid-volume users in a mid-rate bucket, and low-volume users in a low-rate bucket. Cities with existing natural gas connections are to roll out this new system by the end of 2015. August 2014—Notice Adjusting the Price of Nonresidential Base Natural Gas Use, National Development and Reform Commission:131 Further liberalizes pricing for imported liquefied natural gas and unconventional gas including shale gas, coal-bed methane, and coal-based liquefied gas. 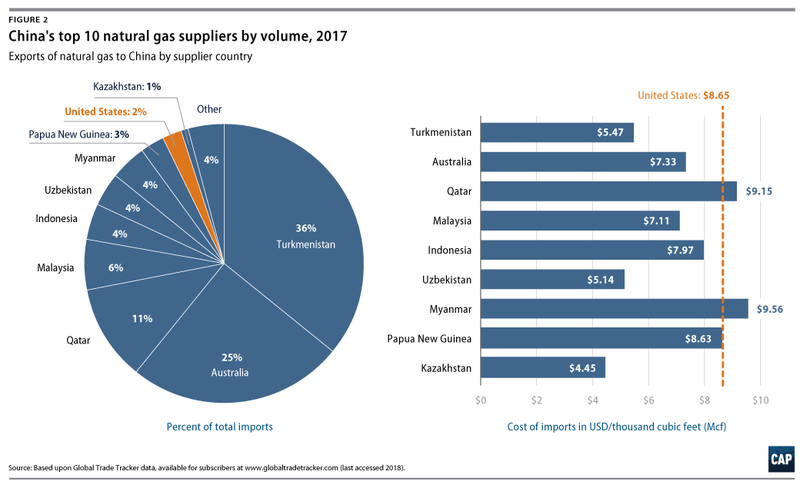 Where such gas is mixed with other sources—such as domestic or imported conventional gas—prices for the entire mix can be negotiated according to supply and demand. Raises city-gate ceiling prices for base-use conventional natural gas. Exempts the chemical fertilizer industry from these price reforms until the fertilizer market improves. June 2014—Energy Development Strategic Action Plan for 2014-2020, State Council:132 Signals that Beijing is significantly increasing its focus on the nation’s natural gas development. Calls for natural gas to account for at least 10 percent of the nation’s primary energy mix by 2020. Orders vigorous production development on all fronts: onshore and offshore; conventional and unconventional. Orders producers to develop eight large-scale natural gas production bases with annual outputs of more than 10 billion cubic meters. Calls for producers to increase the nation’s conventional proven natural gas reserves to a cumulative 5.5 trillion cubic meters and reach a total annual output of 185 billion cubic meters by 2020, which would amount to an annual production growth rate of more than 6 percent. Encourages import expansion and calls for new demand-side measures including support for natural gas vehicles and ships. February 2015—Notice on Rationalizing the Price of Nonresidential Natural Gas, National Development and Reform Commission:133 Decreases the incremental rate by 440 Chinese yuan per thousand cubic meters and increases the base rate by 40 Chinese yuan per thousand cubic meters to create one unified natural gas rate for each province or municipality. Officially removes the prior pricing distinction between base and incremental gas. Implements pilot marketization for natural gas consumers—not including the chemical fertilizer industry—who purchase directly from producers. Those direct purchase rates can be negotiated based on supply and demand. November 2015—Notice on Reducing the City-Gate Price of Natural Gas for Nonresidential Use and Further Promoting Market-Oriented Price Reform, National Development and Reform Commission:134 Reduces nonresidential city-gate gas rates by 700 Chinese yuan per thousand cubic meters. Switches the price management regime from ceiling to benchmark, meaning prices can be negotiated below the benchmark and up to 20 percent above it. Exempts the chemical fertilizer industry from these changes. October 2016—Trial Natural Gas Pipeline Transportation Pricing Cost Supervision and Auditing Measures, National Development and Reform Commission:136 Establishes new guidelines for pipeline transport cost supervision. Pipeline operators must set up an independent cost accounting system for gas transmission services; the State Council Pricing Department is responsible for organizing the implementation of pipeline transportation pricing supervision and inspection work. November 2016—Notice Promoting Marketization Reform of Chemical Fertilizer Gas Use Prices, National Development and Reform Commission:137 Fully liberalizes pricing for natural gas sales to chemical fertilizer producers. Prices are to be negotiated between producer and consumer based on supply and demand. December 2016—13th Five-Year Plan for Natural Gas Development, National Development and Reform Commission:138 Sets new targets and calls for vigorous market development across all fronts. By 2020, annual production must reach 207 billion cubic meters per year, including 120 billion cubic meters of conventional gas; 37 billion cubic meters of tight gas; 10 billion cubic meters of offshore gas; 30 billion cubic meters of shale gas; and 10 billion cubic meters of coal bed methane per year. Calls for national pipeline infrastructure to reach 104,000 kilometers by 2020—with a total capacity of 400 billion cubic meters—and underground natural gas storage capacity to reach 14.8 billion cubic meters by 2020. 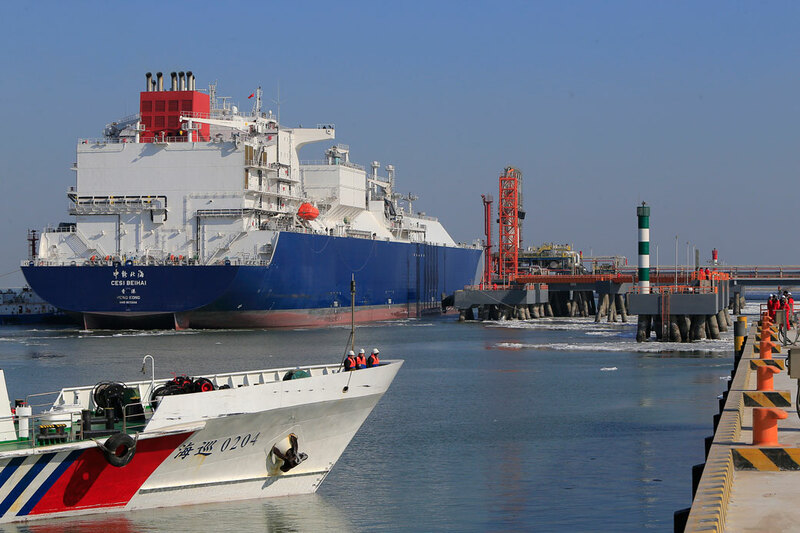 Calls for LNG import infrastructure projects to prioritize large demand centers in the Bohai Rim, Yangtze River Delta, and southeastern coastal areas. Promotes LNG fuel for transport use and sets multiple 2020 transport targets including: reaching a total of 10 million LNG vehicles, 12,000 gas stations, and more than 200 docking stations for ships. Calls for specific natural gas infrastructure expansions designed to support coal-to-gas switching such as small-scale LNG storage tanks in rural areas. Calls for multiple policy incentives to support natural gas supply and demand development projects, including preferential tax policies to support natural gas production and new market-based procedures for transferring exploration and development rights. June 2017—Opinions on the Acceleration of Natural Gas Use, National Development and Reform Commission, Ministry of Science and Technology, Ministry of Industry and Information Technology, Ministry of Finance, and Others:139 Sets 2030 natural gas targets. Calls for natural gas to account for 15 percent of China’s energy mix by 2030 and for China to expand underground natural gas storage capacity to 35 billion cubic meters by 2030. The 2020 targets are 10 percent of the energy mix and 14.8 billion cubic meters of storage capacity. Outlines a cross-ministerial effort for meeting China’s natural gas development goals, with a particular focus on addressing persistent market bottlenecks. Calls for new engineering and development projects to support natural gas use for winter heating, gas-fired electricity, industrial use, and expanded consumer access to natural gas filling and docking stations. Calls for additional environmental regulatory tightening to incentivize increased natural gas use, particularly coal-to-gas switching. Calls for additional progress toward national gas market liberalization and additional financial support to incentivize production and consumption growth. August 2017—Notice Reducing the Nonresidential Natural Gas Reference City-Gate Prices, National Development and Reform Commission:140 Lowers the baseline city-gate natural gas rate by 100 Chinese yuan per thousand cubic meters. States that city-gate prices will be progressively reduced going forward and open trading will be promoted. December 2017—Letter Requesting Good Work on Integrated Coal Management to Ensure the People Stay Warm Through the Winter, Ministry of Environmental Protection Department of Air Environment Management:141 Permits localities to continue using previous coal-fired heating methods—which were to be phased out by year-end 2017—and other alternative heating methods on an interim basis to prevent heating shortages where required coal phaseouts are not yet complete. Orders local officials to give residential natural gas users priority over industrial users and gas-fired power stations when shortages emerge. Warns officials that the Ministry of Environmental Protection will monitor winter heating conditions and hold localities accountable for disorderly pollution management work. December 2017—Notice Regarding the Issuance of a 2017–2021 Winter Clean Heating Plan for Northern Regions, National Development and Reform Commission, National Energy Administration, Ministry of Finance, Ministry of Environmental Protection, and Other Relevant Agencies:142 Orders northern regions to fill winter heating gaps—from the phase-out of small coal boilers—with a range of clean-heating sources to avoid triggering seasonal natural gas supply shortages. The northern region targeted by this plan includes Beijing, Tianjin, Hebei, Shanxi, Inner Mongolia, Liaoning, Jilin, Heilongjiang, Shandong, Shaanxi, Gansu, Ningxia, Xinjiang, Qinghai, and portions of Henan. This region also covers the “2+26” key cities of the Beijing-Tianjin-Hebei air pollution transmission channel, including Xiong’an New District. States that, as of 2016, 83 percent of floorspace in China’s northern regions is served by coal-fired heating and 17 percent by a mix of alternative heating sources, including natural gas-fired heating—which accounts for 11 percent total—electric power, geothermal, biomass, solar, and industrial waste heat. States that 34 percent of the total heat generation can be considered “clean” heating—including clean coal—as of 2016. Sets a new target to expand clean heating to cover 70 percent of the region’s total heated floor space by 2021. Northern regions are to meet that target by bringing new clean heating sources online to replace 150 million tons of dispersed coal, including low-efficiency small boiler coal use. Total clean-heating capacity targets for 2021 include: expanding biomass heating capacity to cover 2.1 billion square meters; expanding electric heating capacity to cover 1.5 billion square meters; expanding geothermal heating capacity to cover 1 billion cubic meters; expanding waste industrial heat to cover 200 million square meters; and expanding solar heating to cover 50 million square meters. The plan puts particular emphasis on clean coal heating, targeting the construction of 10 gigawatts of new back pressure combined heat and power units and retrofitting 120 gigawatts of existing units to reach 11 billion square meters of clean coal heating capacity. The “2+26” key cities are prioritized for new construction of natural gas heating: Between 2017 and 2021, new construction of natural gas heating capacity in these key cities should cover an additional 180,000 square meters. This plan also includes an annex, “General plan for winter coal-to-gas source protection for clean heating in key northern regions,” which formulates a safeguard plan for the six provinces/municipalities of the “2+26” key cities of the Beijing-Tianjin-Hebei air pollution transmission channel and orders the other northern region provinces to create their own natural gas resource guarantee policies for the “coal-to-gas” clean heating program based on this plan. This annex includes targets for the natural gas volume supplied by China’s three oil majors to the abovementioned six provinces/municipalities during 2021, in addition to targets for the construction of new natural gas storage capacity, LNG receiving station capacity, gasification output capacity (from 82 million cubic meters per day in 2017 to 165 million cubic meters per day by 2021), and pipelines.